I am a total sucker these days for anything that involves dancing disguised as exercise. So, we're talking 'Just Dance' on Wii, a good dose of 'Zumba' on DVD... and now: 'Twister Dance'. I was first exposed to this new contraption during my annual see-all-the-new-toys visit at Hasbro's Sydney HQ and already I could visualise myself - er, I mean, my kids - really rocking out dancing to this new toy. Here's the new Twister Dance. With the Twister Dance Game you can learn dances by following the Twister spots to songs, like 'Till the World Ends' by Britney Spears or 'Whip My Hair' by Willow - five songs are included. Or you can dance to your own music by connecting the game to any MP3 player (which is sold separately). Twister Dance Game is essentially a dance version of the classic Twister game. You can learn dances to popular songs by following the lights and stepping on the Twister pots. There are eight movable spots. 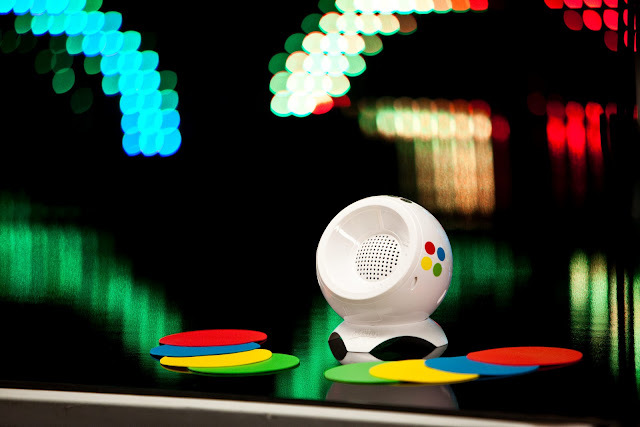 The Twister Dance Game connects to any MP3 player (sold separately). Age recommendation is eight and up [although my kids love it - supervised, of course]. It can accommodate 1-2 players, and four "AA" batteries are required (demo batteries included). And now, Josie's Juice readers can win one of two Twister packs, featuring Twister 2 and Twister Dance, valued at almost $100 for each pack. Two prize packs valued at $94.98 each. Enter now! [Competition only available to Australian residents].